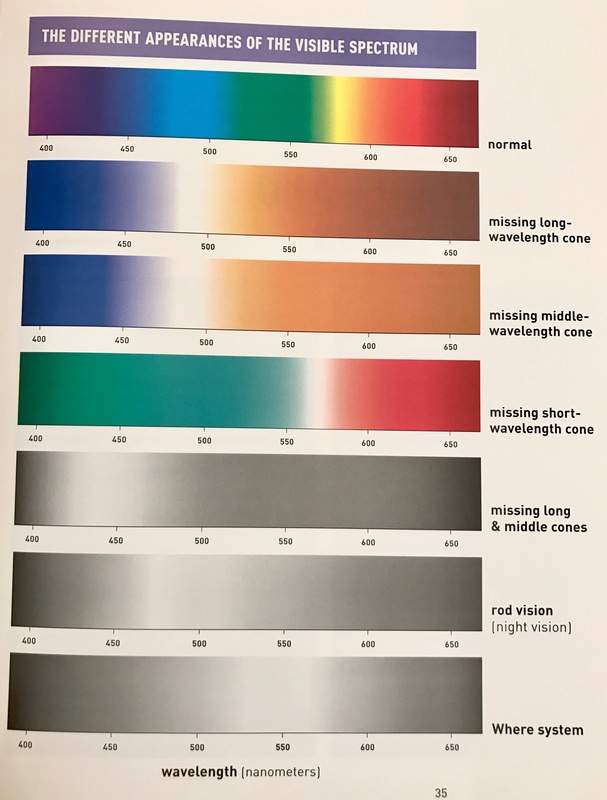 As can be seen in this page of the book “Vision and Art: The Biology of Seeing” (Livingstone, 2008), the blue part of the spectrum aligns with our Rods which are the majority of our sensing cells (about 120 million rod cells and 6 million cone cells (en.wikipedia.org)). This then is an indication that using warmer colours for computer screens would be less strenuous on the eyes, since less brightness enters the eye outside of the main area of visual focus. Livingston also points out that we have twice the amount of red cones as blue cones and I take that as suggesting it takes less work to extract information from a warm screen than a colder screen. I studied the different mentalities different colours engender a while ago and today I was reminded of this and wondered: Why are word processors on the Mac white or grey (by default) while reading applications warm (iBooks, Kindle)? Think back to what it must have been like on the African plains before 400,000 years ago. Sometimes when the evening came the heavens wouldn’t always have been as dark as we we city dwellers are used to today, with our cities producing a large amount of light pollution. When there were no clouds the milky way with the stars sprinkled all over the sky and the moon would have been our companions. Wether or not it was cloudy or clear at night, it would not have been enough light available for us to do much productive work in, and of course moon and star light does not warm us. Before we could control fire we could stay up late, but there was likely little incentive to do so and in darkness we would soon tire. We have used fire to burn off unproductive vegetation and encourage new growth which in turn also encourage more small animals to come for longer than records can tell us. You could say that our use of fire was ‘fire-stick’ farming. Fire reduced the harshness of winter, allowing us to occupy cooler places and thereby become masters of larger parts of our planet. Fire helped improve toolmaking by allowing us to harden blades. Fire would also help us make functional pottery, heat rocks to free metals and later bake tokens and tablets for the first writing. Fire changed our diet by allowing us to cook food, making pieces of meat we could previously not eat tender through the heat, making meat last longer after cooking and reducing parasites (which may have had very far reaching consequences beyond reducing illness from hostile parasites, considering that our healthy, functioning bodies today are host to a very large number (by some measures it could be 95%) of bacteria in a commensalistic (non-harmful to the host relationship) relationship). Fire also became used for signaling using smoke which contributed to inter-tribal communication and collaboration – when you have a longer range means of communication it pays to use it by making allies of those you can reach, to help you prepare for attacks by those further away. There is speculation that this may have been a key to us winning out over the Neanderthals – wider cooperation made possible by fire smoke signaling. Now we not only manage fire for changing large swathes of forest, now we have fine enough control over fire to bring it home and huddle around it, stay up late in close proximity, socialize, and think different – firelight had pried open the conscious part of the circadian rhythm we had evolved in – we stayed awake longer, with a new mindset. Our own eyes are not nocturnally optimized so there is not much hunting we can do late in the evening. We put idle hands to good use working our tools but not to a significant degree (which didn’t evolve much for thousands upon thousands of years). Words and words. In the evenings, fire would foster sociability within the tribe as we would huddle up and stay in close proximity for extended periods of time, something there would be little value to do during the day. As Henry de Lumley points (in “Becoming Human” (Edited by Colin Renfrew and Iain Morley, 2009), that “fire was mainly a factor in inspiring conviviality. Group spirit was surely kindled around the hearth. This was the birth of the first myths. It is at this point that the first regional traditions emerged: the first cultural identities, showing styles and design in the manufacture of some tools”. We build hearths and start to see the world in a different light, visually as well as metaphorically. Maybe we create the first ‘games’ on such evenings? Maybe it started with more controlled play? Maybe we added ‘game pieces’ later, in a mirror of how we invented counting and writing? I would like to suggest that the difference between sports (team or individual) and games (card games through chess etc.) is largely that sports are daylight activities with emphasis on competition but games are evening purists with emphasis on sociability. Can it be that games made us more social, rather than gaming coming from our sociability? Maybe, but it’s clear a different social interaction would take form in such closely huddled, warm and safe settings. Whatever the stages of social evolution, the animal which spreads out at leisure during the day and goes to sleep when the sun goes down, is a very different animal from the one which huddles closer long into the evening, around a warming, illuminating fire, bringing the individuals closer. As the circadian rhythm changed with the control of fire, the sunset period would last as long as we had fire wood. The sunset darkens over the horizon and the flames come out, the colour of burning wood have a similar colour to a sunset (6-700nm wavelength or so), so fire indeed draws out the sunset, it does not disrupt it. With fire, there was reason to stay awake longer, and we did: “Humans historically spend about 8 hours a night sleeping, whereas our closest cousins chimps, rhesus monkeys, squirrel monkeys and baboons spend 10 hours in bed” (library.thinkquest.org). Gorillas 12 and owl monkeys spend 17 hours sleeping per day. Fire definitively seems to have lengthened our waking time. As we stay awake longer, most of the predators we fear are kept at bay by the firelight so we can relax more than we can during the day or during the night before the time we controlled fire. Our bodies change daily in concert with the rhythm of the colors of the light changing from reddish in the morning to whitish blue and back to reddish, changing our state of alertness, body temperature and pressure, metabolism, and reproduction. Let’s look at Joan Roberts list in more detail: Light exposure in the morning increases Cortisol, the stress hormone, Serotonin which deals with impulse control, Gaba – available to calm us down and Dopamine perking up our alertness levels as well as modifying the synthesis of follicle stimulating hormone (reproduction), gastrin releasing peptide and neuropeptide Y (hunger). As the day progresses we are showered by strong blue-white light, stress and alertness increases and is controlled. The sunset period allows for the production of Melatonin which promotes sleep and dreaming. World Of Molecules (worldofmolecules.com) reports on research by Alan Lewis (Melatonin and the Biological Clock 1999) that some hallucinogenic drugs emulate melatonin activity in the awakened state and that both act on the same areas of the brain. Controversial as it may be that Melatonin may have hallucinogenic properties, it’s clear that we are chemically different during the morning, noon, evening and night and with fire twilight has been stretched beyond what was available before – we become relaxed, yet there is reason and opportunity to stay awake for longer. This is a new chemical state of mind, brought about by the new, longer evening light. Picture the difference between the wide-eyed, clear thinking and discussion you might have when going for a walk during the day vs the deep, perhaps mystical, conjectures discussed over an open flame in the late evening. Picture further how fire would allow us to shine flickering lights on cave paintings, giving life and ‘animating’ the lines we mark. Being tired during the day you have the sun’s signals telling you to wake up. Being tired at night you are in synch with your body chemistry and you can think looser, without the stress of reality in the form of stress and alertness hormones shaping the meanderings of your musings. Dreams are made when we are safe, free, warm and relaxed. Dreams are realized in the cold glare of reality. Together we have a harmony of progress. The question then becomes why are computer screens white or grey (cold/neutral) when writing but computer books warm? Should we maybe have a feature where the reader and author can choose what frame of mind they would like to be in? Or maybe a screen worth of colour is not enough? This is why I ended up making the screens warm in Author. Further investigation could be useful.